Knit, lit, and general nerdery. Needles: Blurgh. I need to start taking note of these things. Notes: When we brought home this chubby little dude, our daily walking increased a lot. Angus was really overweight, so we started taking him for two walks (between .5-1 mile each) twice a day. It was rather warm at first, but it didn’t take long for J’s hands to get chilly as autumn progressed. He requested some handknitted fingerless mitts, preferably to match his favorite hat, so that he could grip the leash and pick up poo (gross reality) but still keep his fingers warm. 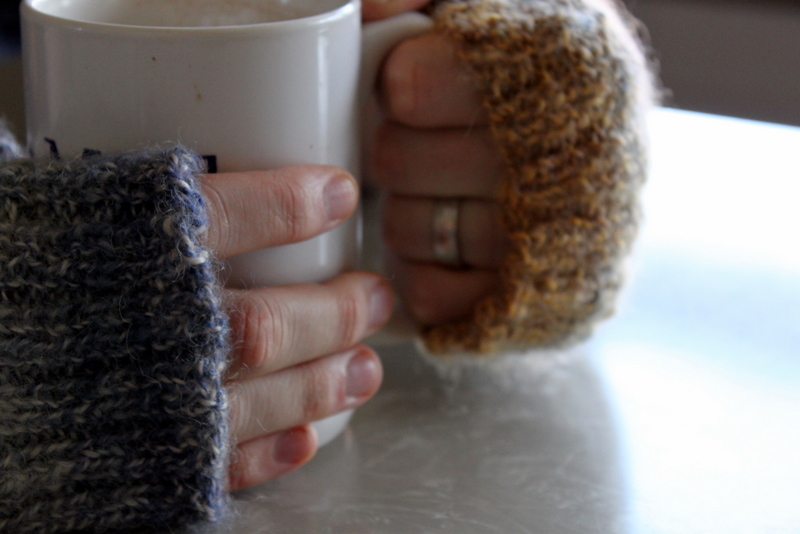 I scoured Ravelry for some ideas, and J liked Man Paws best. It’s a great simple pattern, but I changed it to fit my yarn, J’s hands, and my needs. My project notes say what I did differently exactly, but I basically just did my own fingerless mitt pattern (different CO number, different cuff/hand length, different increases, different bind-off, etc.) with 2×2 ribbing like the pattern suggested. I lengthened the mitt part, so J can fold them back when doing puggle business but keep them long to keep his fingers warm while walking. It took me forever to photograph them because he’s been wearing them non-stop since I finished them two months ago. I call that a win. « FO: Pinchy String Art! win indeed. and can i put in a teeny request for more angus pictures ’round these parts? love the mitts. Angus is cute! 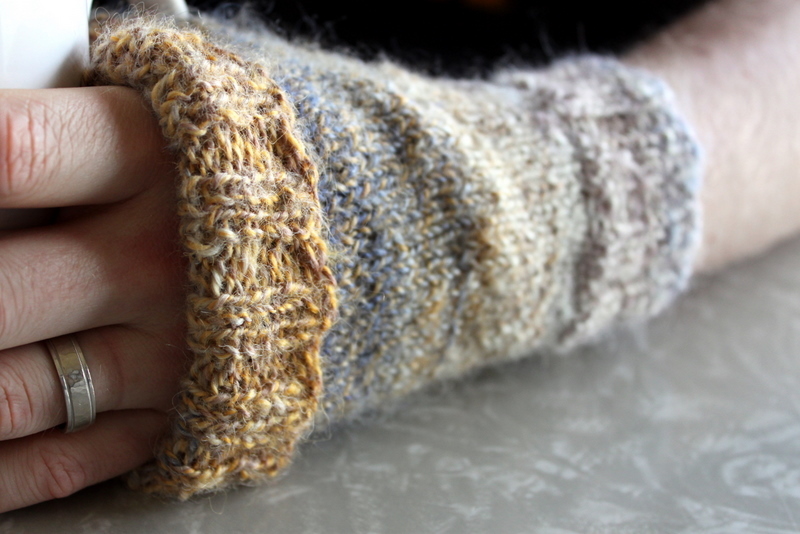 The mitts are super nice (and match Angus’ coloring…). Ok I have a theory on the needle thing. I think it’s because on Ravelry, all of the other fields on your project pages are fill-in boxes. BUT, to add a needle size, you first have to click on “add a needle.” I always forget to do this, because I just fill out the boxes that are staring at me. Nice job on the mitts and the spinning! You’re right, the greatest reward is when your recipient never takes off the item!